It’s amazing when you think about it, just how much time we have outside of work. Each weekend, from 5pm on Friday to 9am Monday morning, we have 64 hours waiting to be filled with adventure. And the same goes for mid-week evenings too - 16 hours of free time. That’s not to say you’ll want to fill it all with adventure, I think that really would be a bit of an adventure over-load. But just now and then, opt for putting in the effort to get outside when you wouldn’t normally. For me, I love to kick off my Mondays in a new location every week (check out my Happy Monday videos over on Facebook), but I rarely fill my evenings with adventure. The odd 5–9 camp out, may be once every month or two, but never have I used that time to really travel and discover a new route or destination, knowing that I have a full week ahead of me. So one Monday I decided to change all that. I left work and kept going (via a pit stop at my home which happened to be en route) until I hit the coast. It had been a year since I last cycled London to Brighton and I fancied doing it again but via a different route. Here is a brief rundown of how I cycled to the coast on a Monday evening after work. I use my main bike for everything from going to work to long distance cycling adventures. It’s a Specialized Vita Comp (about 4 years old), which is a hybrid, so lighter than a mountain bike but not as skinny tyres as a road bike, and with a rack fitted to the back so I can easily throw my kit on. For this kind of trip, just a few hours and no camping, all I needed was one pannier to carry a jumper and jacket for the train ride home, some snacks and a puncture repair kit, and of course I had my trusty Lumos helmet and some lights for when it got dark. My only other essential bit of riding kit are my Liv cycling shorts. I have a few different pairs of padded shorts, but these are my go to pair and always keep me comfortable on long rides. I was lucky that my home falls between where I work in South West London and the coast so I could stop off en route to ditch my work gear, pick up the all important snacks and have a quick cuppa. 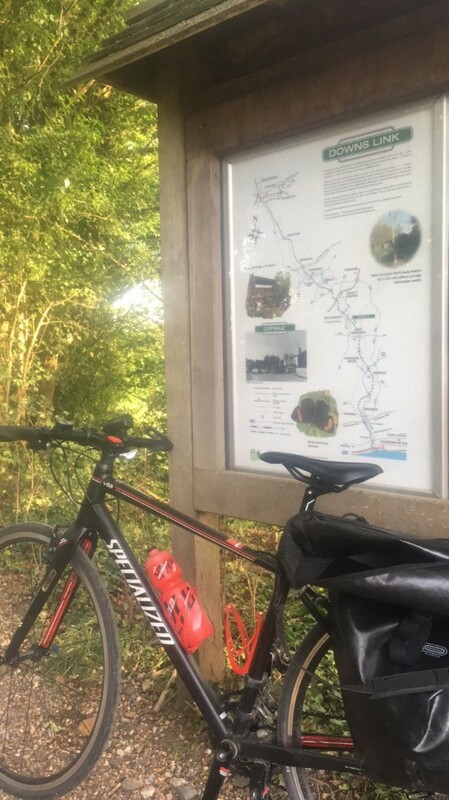 From this starting point to the west of London I found a simple route south which, around half way, picked up the Downs Link. An old railway line that originally opened in the 1860’s, it was closed around 100 years later at a time when the UK lost almost 4,000 miles of railway lines. It’s since been converted into a walking, cycling and horse riding path. Starting in Guildford it goes all the way to the south coast: a perfect option if you want to get off the roads. The section I was on from Copsale was also pretty flat which makes the going much easier and of course, once I’d joined up with it, it removes all need to navigate making progress much quicker. The Downs Link route goes through towns along tree covered paths and then out into lovely open countryside, alongside tall corn fields and past a herd of rather smelly cows. It was fairly quiet with the odd dog walker and runners at various points and made for a nice relaxing ride. My bike coped fine with the small gravelly/sandy sections, but I wouldn’t want to tackle those with tyres that were any thinner though, so I would stick to roads if you have a road bike, or opt to walk those sections as some were a little steep too. I left my house around 4:30pm (I finish work early) and hit the coast exactly 5 hours later at 9:30pm, having had some rest breaks along the way. If you opted for roads and went flat out you could probably do it closer to 4 hours. It had just gotten dark when I got there and a train strike meant I had to jump on the train asap to get home, but if you opted for the longer daylight hours at the height of summer you’d have no problem making it all the way with some time for dinner on the beach before the sun sets. Alternatively, pick a spot closer to aim for. May be there’s a lake or river you’d like to check out. Either way it was great to kick off the week with a little adventure and do something I wouldn’t otherwise consider.